Our last day in Paris was all about the Eiffel Tower. Having mistakenly not pre-booked tickets we were prepared to queue for many hours to get the best view across the city. We had toyed with the idea of getting up extra early to try and beat the queues… but that never happened! We made our usual stop at the patisserie up the road and picked up our breakfast pastries along with a fresh baguette, ham and cheese – ready for a little picnic. We arrived at the Eiffel Tower at around 1pm to find queues… which we expected. We joined one and waited in the cool crisp wind. To go from the end of the queue to the lift up to the second floor took us about 1 hour and 15 minutes… which actually flew by thanks to our excitement. Matt has never experienced the Eiffel Tower and I have only ever been up it at night. We weren’t brave enough to take the stairs up – we only walked back down. If you are brave enough to tackle the 704 steps up to the second floor you benefit from a shorter queue a reduced entry fee and also a big calorie burn! So we took in the view going up via the lift. When in the lift you can really appreciate the wonder of the old lady and it’s structure. If you don’t fancy going all the way to the top you can also just visit the second floor – ideal if you’re not a huge fan of heights… although it is still pretty high as you can see below! Once you arrive on the second floor you have to queue for a separate lift to take you up to the top floor. Thankfully we didn’t queue too long as it was quite chilly at such a height! Upon arriving on the top floor we ran straight up the steps and straight to the edge to take in the view. And it’s definitely not one that disappoints. From such a soaring height people really do look like little ants below. It was fantastic to see the different areas of the city span out in front of us. You can spot a few landmarks such as the L’arch du Triomphe, Place de la Concorde and La Lourve, along with Tour Monteparnasse nearly directly opposite. What I never realised before is that there’s actually a champagne bar on the top floor of the Eiffel Tower! Probably for all those proposals that happen up there. At 12 euros for a plastic glass we decided to give it a miss… but there were a few couples enjoying a few glasses while taking in the view together. After spending about twenty minutes circling the top floor, spotting a few of the landmarks we had visited over the past couple of days and taking a few selfies we made our way to the stairs and started our decent to the first floor. The first floor has a number of attractions on it, such as the cafe, restaurant and even an ice rink in the winter months! I was brave enough to walk across the glass floor and was surprised to even tempt Matt onto it! After spending our afternoon enjoying the wonders of the Eiffel Tower we took a walk along the River Seine towards Les Champs Elysse with only one thing on our mind… macaroons! Laduree is a firm favourite of mine and has been since I lived in France four years ago. My friend and I would catch the train up to Paris and indulge in a bag of macaroons and go and eat the in the park in the Spring sun. We queued for a little while (there is always a queue at Laduree) and treated ourselves to a box of 16 which included a few flavours we hadn’t tried before; maple syrup, pecan and vanilla and strawberry candy. However I think my favourites are still pistachio and raspberry. In the evening we headed back to the Latin Quarter for food and decided on something a little special for our final evening in Paris. We jumped on the metro and headed to Tour Monteparnasse. Located in the Montparnasse area of Paris, Tour Montparnasse is a 210-metre office skyscraper with a restaurant, bar and viewing platform. 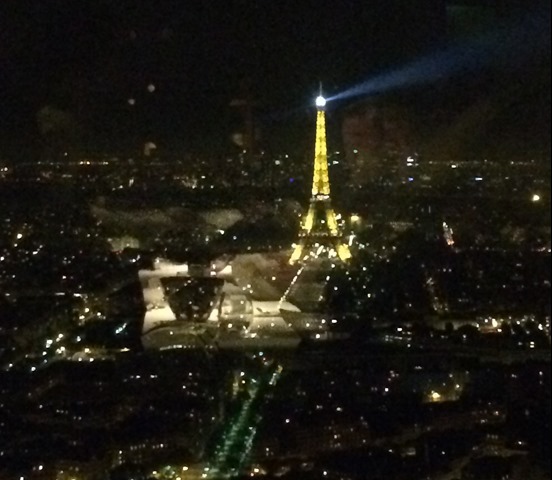 We caught the lift up to the 56th floor to Ciel De Paris and were greeted by a 15 minute wait for the bar. Upon entering the restaurant and bar we were very impressed with the view! We ordered two very large glasses of Sancerre and were shown to a table with an unforgettable view! Plus we arrived just in time for something very special that happens for the first 5 minutes of every hour from 11pm. It was the perfect end to the perfect break in a magical city! I’ve been to Disneyland Paris but never seen any of the famous landmark. I need to go back! Your trip looks amazing! I’ve never been to Disneyland Paris. I’ll have to do that when I’m next there and you’ll have to do the landmarks. Your pics are amazing,it seems that you had a really great time!! !I also loved your blog you look so fresh and energetic!Keep it up! Thankyou. I had an unforgettable time!